Ali Robertson leaping over one of Strathfarrar’s finest boggy bits. 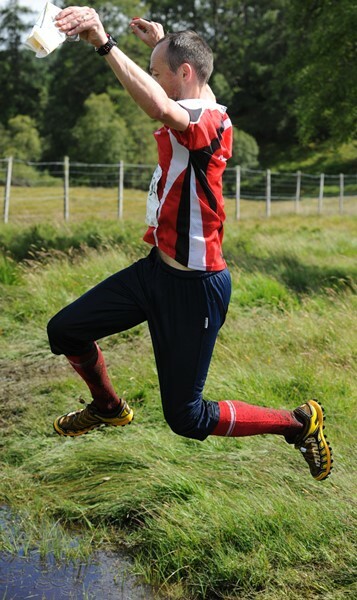 This may look impressive but is as nothing compared to the hoops Richard Oxlade and Anne Hickling have been jumping through on our behalf over the last two years in their respective roles as Highland 2015 Co-ordinator and Scottish Orienteering 6-Day Event Co. Ltd Chairman. A huge thank you to both of them for delivering another great 6 Days despite the added complications of dovetailing with WOC 2015. Richard even found time to run 4 days of the 6 coming 49th in M55S which is even more impressive given what must have been churning through his mind rather than concentrating on the map. 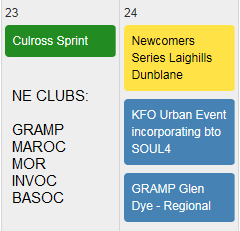 Several other Gramps were drafted in to help on the Highland 2015 Central Organising Committee too: Kevin Reynard – Treasurer (not to mention his band of eager helpers back at his Counting House), Jayne MacGregor and Anne Hoy – Traders (free coffee and burgers as perks of that job), Anne Hickling again – Nairn Open Sprint Organiser and Rest Day Co-ordinator, Helen Rowlands – Website Updater and Routegadget Putter-upperer. We also provided Planners for Day 4 in the shape of Ian Searle and Pete Lawrence (to fill gaps left by more experienced members of other clubs drafted in to plan WOC courses), David Esson was the Planner/Organiser for the MTBO on the rest day, Jonathan Smith for the Trail Run and of course all of us stepped up to the mark to deliver Day 1 in true well-organised Gramp style with help from orienteers from WCH, WIM, Goldseekers, SLOW and INVOC. Big thanks go to Adrian Will and Helen Anderson for being our Day Organisers, Ali Robertson as joint Planner with Fraser Purves of FVO and Neil McLean as Controller along with Roger Coombs MAROC. Somewhere in amongst all that activity, about 70 Gramps, from M/W10 and less to W75, found time to run or hobble round most days and enjoy the best terrain that Scotland has to offer, not to mention some serious relaxation with great banter and camaraderie in the club tent and at the BBQ. We had one podium finisher in the overall results: congratulations to Kate Robertson on her 3rd place W35S.